Paul and I got together earlier this month for a game of Warhammer 40,000, and we set up a fun narrative scenario with a twist — he would be horribly outnumbered, with defeat all but guaranteed, and the game outcome would instead be determined by the margin of his defeat. For this game, Paul was running his relatively small Sisters of Battle force, as he wanted to get some more experience with the “beta” codex rules. These are the vanguard elements of what we hope will become a full-sized Adeptus Sororitas army, once the eagerly anticipated plastic kits get released later this (?) year. On the other side of the table, I wanted to get some action with my Night Lords Chaos Space Marine army. You might have noticed that these fellows haven’t been featured on Comrade’s Wargames in at least a year or so. I haven’t been extremely satisfied with the paint jobs I gave them long ago, but recently I pulled them out of their foam and began a paint touch-up project: highlights, improved lightning bolts, better metallics, maybe even a splash of blood here and there. With Paul’s rather small force of Sororitas and my large, newly updated Night Lords army, we decided on a “last stand” scenario set on Koffa, one of the fringe worlds of the Ianthe Sub-Sector. That area is the home base for Paul’s nascent Sororitas army, and we decided that a small scouting party was following up on rumors that a saint’s relic — the knuckle bone of St. Theodosius the Spiteful, perhaps, or a scrap of vellum from St. Euphrati’s Litany of Redemption — had been found in the hinterlands of Koffa Proxima. To wit: Paul plunked down 35 Power Level of Sororitas, and I dropped a sledgehammer consisting of 75+ Power Level of Night Lords. If Paul survived to turn 3, the outcome would be that his Sisters of Battle covered themselves in glory as they died defending the saint’s relic. It would be a last stand worthy of a codex book cover illustration. If Paul survived to turn 4, the outcome would be that a small force of Sororitas escaped the slaughter on Koffa, carrying word that the fearsome Night Lords were once again on the move in the Caluphel sector. The rest of the Sisters would, of course, be butchered. Note that there was no outcome that meant defeat for the forces of Chaos — the structure of our game had ensured victory for them, and defeat (in one shape or another) for the Imperium. At this point I want to pause and note just how magnanimous Paul was as we developed this scenario. He knew he was facing defeat, and he also knew that we’d be creating a beautiful tabletop experience as the Night Lords enveloped the Sisters of Battle. I pledged to him that I would return the favor and serve as a punching bag for him if he wished to do a similar game, with an outsized force of Imperium attackers falling upon a much smaller force of Chaos baddies. The game got underway with a massive advance by the Night Lords. Vath’Shuga the Cauldron of Rage, my daemon prince, led the way, alongside a Rhino and a Land Raider stuffed with murderous Night Lords. The resolute defenders were entrenched in craters and behind sandbags, awaiting the onslaught. The forces of Chaos broke like a wave upon the defenders, pouring a fusillade of devastating firepower as the tanks and infantry closed in. Paul’s defenders took heart when the Canoness of the Adeptus Sororitas met Vath’Shuga in single combat. Against a backdrop of sonorous chanting provided by the Bishop, the Canoness smote Vath’Shuga upon his pink little head, banishing the foul daemon to the warp and ending (temporarily) his reign in the mortal realms. Alas, it was but a pyrrhic victory. Within moments of Vath’Shuga’s demise, the Night Lords had breached the Sororitas’s lines, sending fearsome war machines and tanks full of infantry rampaging into the backfield. By now, the Sisters of Battle were starting to drop left and right, and the defenders were falling back to the landing zone on the other side of the big ruined building. And the Night Lords had one last card to play. Even as the Chaos infantry deployed from their Rhino and Land Raider, a flight of Raptors swooped in on jump packs and engaged the defenders in a swirling, brutal melee. The walls were closing in for the Sisters of Battle. As the final few defenders hoisted their swords and charged into melee with the rampaging Night Lords, we checked the turn clock. It was turn 3! That meant the Adeptus Sororitas had indeed managed to force a glorious, book-cover-worthy demise by holding out in the face of overwhelming odds. The Night Lords noted this achievement as they dismembered the corpses of the slain to add new skulls to their gruesome trophy racks. And so we concluded a fun and climactic game where the overall outcome was never in doubt, but where the Sisters were able to achieve a backs-to-the-wall demise worthy of song. Paul had a chance to explore some of the new Sisters of Battle rules, including the Rites of Faith — a sort of pseudo psychic power that functioned slightly differently. Faith points are given out whenever a Sororitas unit takes wounds, and each Rite can only be attempted once per turn. This really encourages you to use all of the different Rites of Faith each turn, rather than relying on just one or two powers. I like this, as it prevents players from just spamming the very best abilities over and over again, thereby skipping over the slightly less optimized (but still fun and flavorful) abilities. Paul is certainly set up to exact his revenge upon my Night Lords. He just needs some new plastic Sisters of Battle to make it happen! I’m back with my second batch of vintage metal Plague Marines augmented with snazzy resin bits from Spellcrow. These were a lot of fun to build and paint, and they look surprisingly OK next to some of the newer Death Guard figures that have come out recently. These guys will hit the table later this month in a game in our Caluphel Awakenings narrative campaign. I’m a big fan of the Middlehammer-era Plague Marine aesthetic, particularly the WWI Prussian-inspired gas mask helmets with spikes on top. I also like how the Nurgle details on these older figures are subtle and understated: cracked armor, a few boils and buboes, but nothing too zany. The gnarly upgrade bits from Spellcrow let me really push things over the top, which is nice. These guys have a few notable conversions. Here’s a mace of contagion on this champion armed with a plasma pistol. On a whim, I attached a missile launcher from the old metal Chaos Havocs kit to one of my Plague Marine torsos. I think I’ll run this weapon as a plague launcher in my games. I also tried my hand at a flail of corruption conversion (another potent close combat weapon available to the Death Guard). I don’t have a particularly large bits box, so I was pleased that I was able to cobble together something halfway useful. 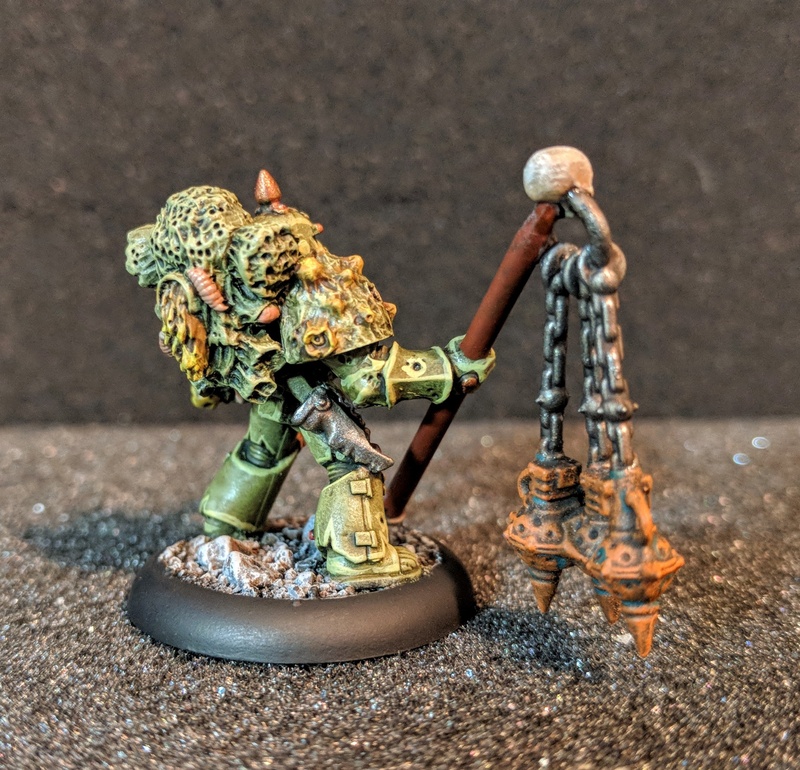 I had a lot of fun playing around with GW’s technical paints — namely Typhus Corrosion and Ryza Rust — to finish off the rusted censers at the end of the flail. And lastly, I used a bit of green stuff to obscure an Imperial eagle on this plasma gun conversion. It was a simple trick that looks perfectly serviceable with a little paint. I’ve got another 10 or so vintage Plague Marines waiting to receive a similar treatment (Spellcrow bits + quick paint job). After that, the basic footslogging infantry in my Death Guard warband will be complete! Krakmarrow sneered in disgust, grateful at the moment for the pitted, brutish helm that enclosed his ruined face and head. He half-turned to glance at his fellow Plague Marines. They were impassive in their ancient, ichor-spattered armor, but doubtless they shared his sentiment. Behind him, Typhus continued talking. Outside the bunker, the ever-present winds of the Rictus Moon howled furiously. 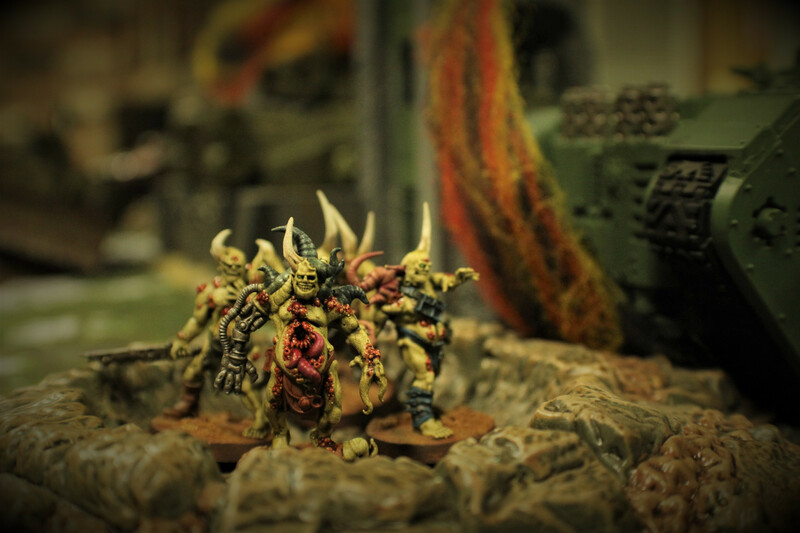 The Maggot Magnates are a band of vile renegades dedicated to Nurgle, the God of Decay. Nominally a vectorium operating as part of the vast 7th Plague Company, the Maggot Magnates tend to find themselves trailing behind the advancing plague armies, reaving and pillaging after the bulk of the army has passed through an area. As a result, the Maggot Magnates under the leadership of Lord Brasque Krakmarrow have developed a reputation as reavers and cutthroats. 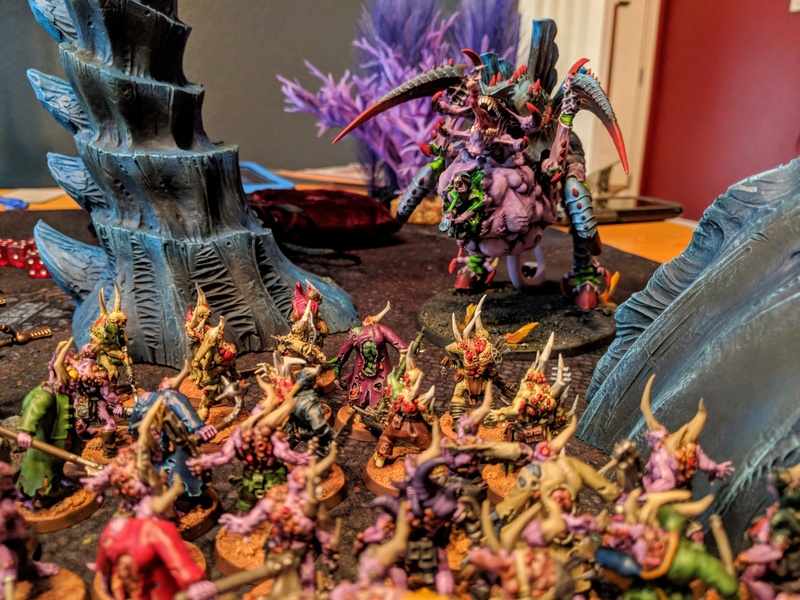 They are known for raising vast, bloated hordes of poxwalkers from the newly slain victims in each warzone they encounter. 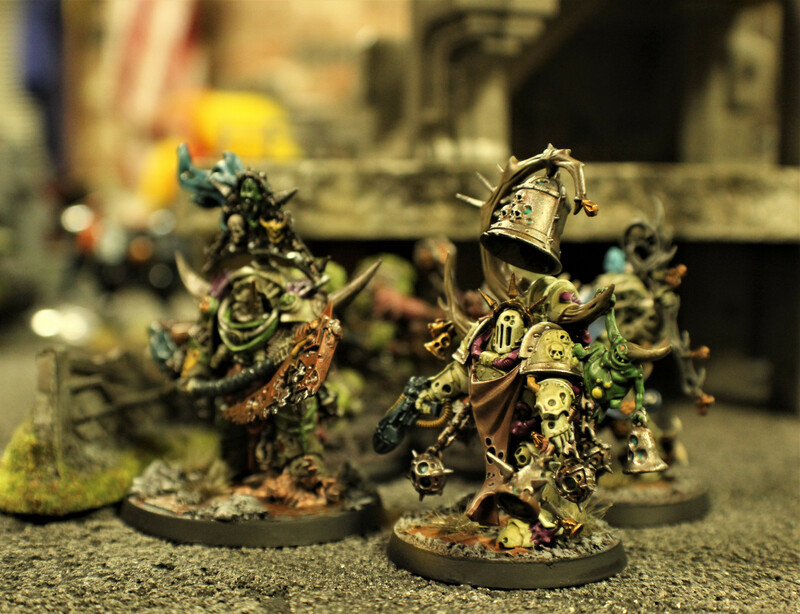 These reanimated corpses then follow behind the Maggot Magnates as they continue the advance — creating a stumbling, moaning train of freakish monstrosities that stretches for miles behind the advancing Plague Marines. During the 13th Black Crusade, the Maggot Magnates found themselves taking part in the campaign to seize the Scourge Stars — that trio of worlds near the Realm of Ultramar that became the launching point for Mortarion’s campaign against the Ultramarines. In support of this mission, the Magnates were deployed to take and hold the Rictus Moon, a wind-ravaged former mining colony on the eastern flank of the Scourge Stars. The assignment kept them far from the primary thrust of the campaign — but all of that changed when Caluphel Prime blinked into existence in the Eastern Fringe, a casualty of the crackling warp storm known as the Cicatrix Maledictum. Initial observations were shocking, indicating that Blackstone Pylons had erupted from the planet’s surface. The Rictus Moon was suddenly a strategically important location as the forces of Nurgle began rushing to exploit the newly arrived Caluphel system before the bealeagured forces of the Imperium could muster a response. Ever since I read the entry for the Foetid Bloat-Drone in the Chaos Index, I had been rather enamored with the “fleshmower” alternate weapon configuration. As the name suggests, the fleshmower transforms the Bloat-Drone from a mid-range fire support unit into a hard-hitting close combat unit. 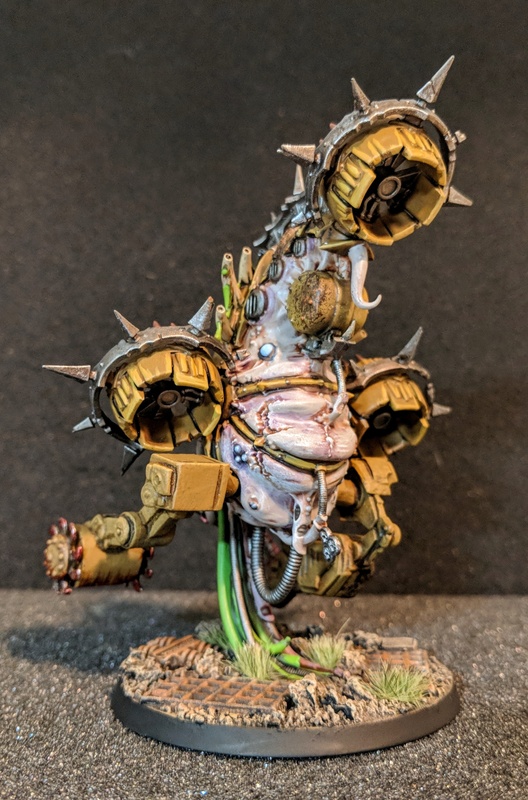 The fleshmower didn’t appear as an option on the Bloat-Drone that came in the Dark Imperium boxed set, so I began thinking about how make my own conversion. Later, of course, a proper fleshmower kit was included in the stand-alone Bloat-Drone box. But my mind was already racing with ideas for a conversion using some of the gnarly blade arms from the Mechwarrior collectible miniatures game, which came out many years ago and still provides a wealth of interesting industrial-looking bits on many of my projects. In particular, Mechwarrior had a lot of battlemechs with crazy melee weapons — spinning blades, grinders, cutting implements and other brutal apparatus. I’ve got a plastic tub filled with leftover figures and vehicles, many of them broken, and it’s served me well as a bits resource. For my fleshmower conversion, I took a deep dive into that plastic tub and came out with two likely candidates: an industrial grinder arm and a dual chainsaw arm. I had initially wanted identical weapons for my fleshmower, but as I looked at these two pieces, I warmed to the idea of an asymmetrical loadout. It somehow made the whole model look even more heavy metal. I also snipped off the mosquito-style nose on the Bloat-Drone and replaced it with another spinning blade. To me it seems like this guy uses his utility arms to cut up his prey and bring it closer to his snout, where it gets pulped into a fine purée, perfect for being slurped up by his trailing tentacles. Yeah, that’s the stuff. The challenge with Mechwarrior bits is that they’re made from PVC, a slightly more pliable material compared to the polystyrene used in most Warhammer kits. And the sculpting detail is much softer, which sometimes makes Mechwarrior pieces look silly next to the much sharper Warhammer models. My solution was to cover the cutting implements with a nice splatter of Blood for the Blood God to cover any imperfections or soft details. I painted this guy in an ochre/yellow paint scheme, which was a departure from my previous Bloat-Drone palette, but still somewhat related. I think they’ll look nice on the table together. I also whipped together a nice scenic base using some random industrial bits I had lying around on my workbench. I think it really ties the whole thing together. The end result was everything I had been hoping for. Sure, it’s not an “official” fleshmower, but it’s totally awesome and anyone who tries to give me any guff about it is going to get an earful about creativity and making the hobby your own. Up next on my workbench is another 7-man squad of vintage metal Plague Marines kitted out with resin upgrades from Spellcrow. I’m really loving the aesthetic this creates, and it’s a great way to give new life to some awesome old models. Stay tuned! 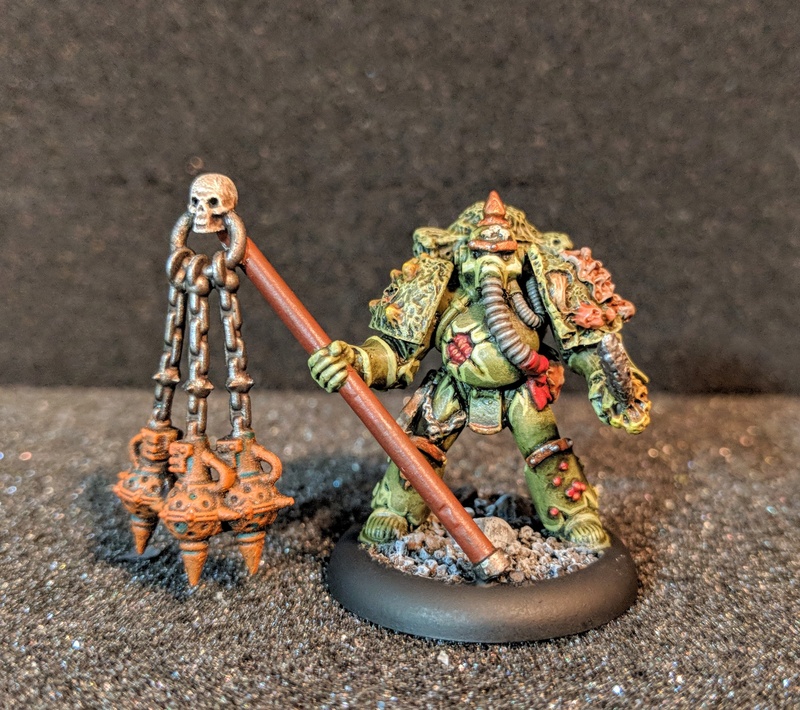 I know there are a ton of cool, new Death Guard models out there, but I’m still hopelessly in love with the old-school metal Plague Marines that I ogled as a kid, before I’d ever bought my first miniature. I’ve been scooping up these guys on eBay and elsewhere over the last few years. I knocked out my first squad last year, and just this week I finished my second squad. For this group, I sourced some fun new resin accessory pieces from Spellcrow, a great little boutique model shop based out of Poland. I snagged a couple sets of their awesome Plague Legions backpacks and arms — just the thing to add some detail and interest to the already awesome Plague Marines. I went with my typical fast-and-dirty paint job for the armor, but I slowed things down and took my time applying different color washes and shades — purple, sepia, brown and even blue — to the models to create interesting effects. This was my first time using shades in this manner, and I learned a lot. The Spellcrow upgrades were replete with swollen growths, boils, maggots, slime and other fantastic details to paint. Even though they had a distinct style, the Spellcrow bits seem to mesh well with the other plastic pieces I used on these figures (particularly after they were painted). Sidenote: Spellcrow is well known for tossing in bags of freebies and samples with each order. On at least one of my orders, my freebie bag included almost as much stuff as I actually paid for through my order! If you want some of their stuff, it’s definitely worth it to order directly from their eBay store. In this case I didn’t finish the models off with the magic dip, as I wanted to keep the colors bright. I’ve also included a couple photos of the backpacks, as they were all really cool and unique, with lots of nifty details to paint. I could have spent twice as much time on the backpacks alone! But of course, my mantra is “more toys on the table,” so I stopped myself before I went too far down that rabbit hole. I’ve got one last batch of these old-school metal Plague Marines sitting in a paint stripper bath, so I’ll probably have one more project like this ahead of me this year. Then I’ll move on to a few remaining Death Guard vehicles and characters, and after that my army will be done! Well, my new baby is one month old today, and I noted with some amazement that I was able to paint up 10 Poxwalkers over the last 30 days, even while I was juggling a hospital stay for the birth, visits from doting grandparents and plenty of late nights rocking a fussy newborn. So I’m sharing a few photos of these nasty buggers and also congratulating myself on accomplishing a bit of hobby progress in January! For my first batch of Poxwalkers, I went with the standard rotting green flesh color. 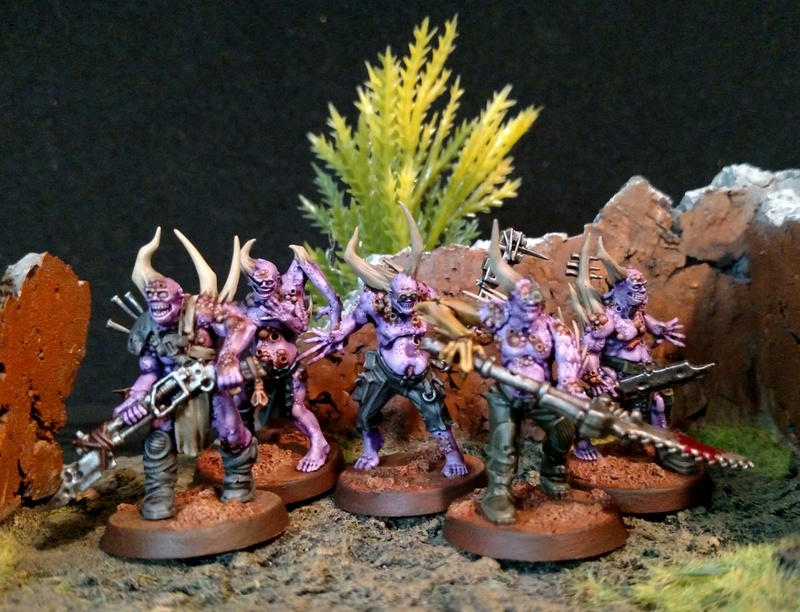 For these guys, I wanted to try out a new flesh color, so I gave them a few washes of purple shade, plus sepia on the boils and sores, to create a suitably gnarly flesh color. Maybe these guys are the reanimated corpses of a starship crew that was killed after an explosive decompression in the void? And they floated in hard vacuum for a few weeks before Papa Nurgle saw fit to reanimate them for his legions? Yeah, that’s it. That might explain the purplish tone of their flesh. I did some head and weapon swaps on these guys to differentiate them from the stock sculpts. Aside from the flesh, I went with a fairly quick and simple paint scheme for their clothing and weapons — after all, the goal here is to get these guys done to a passable tabletop standard. Anyway, I’ve got another 10 guys to paint up in a similar paint scheme. Once they’re done, I’ll have two full-sized blocks of Poxwalkers ready for my new game of Warhammer 40k. 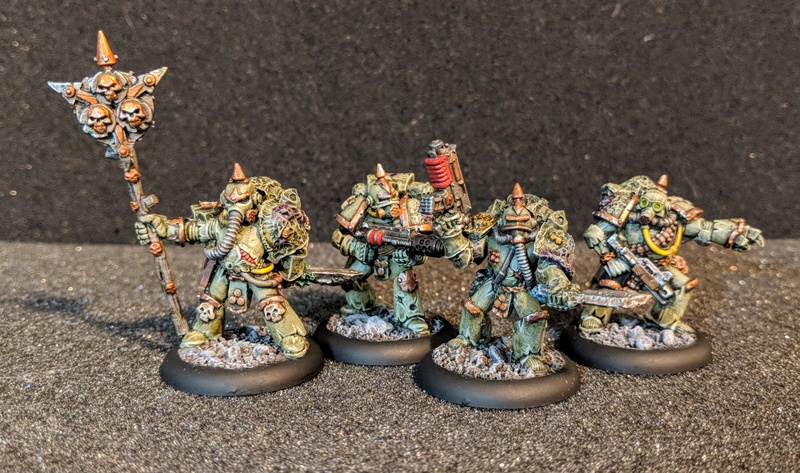 In addition to being fairly effective on the battlefield, these guys look great in a big group, surging across the battlefield toward the enemy lines, blazing a trail for squads of heavy hitting Plague Marines. Stay tuned! My ten or so readers may have noticed that Comrade’s Wargames has gone silent since my last, epic, end-of-the-year post about our Apoc-Luck game at the Girl Scout center. In truth, that game was intended as a temporary swan song for me, as I welcomed a new baby boy in early January and will be consumed with fatherhood for at least a few months, before sleeping and eating schedules settle down a bit. In the last few days before the baby arrived, I knocked out a handful of last-minute miniatures: Typhus, the Herald of Nurgle, three Death Guard Plague Marines, and the Foul Blightspawn — all intended as reinforcements for my burgeoning Death Guard army. Here’s Typhus. I always liked the old metal version of him, particularly after the debut of the new, slightly silly plastic model last year. Once I decided the new model didn’t suit me, it wasn’t to find a poorly painted metal Typhus for $10 in an online buy/sell group that I could strip and repaint. 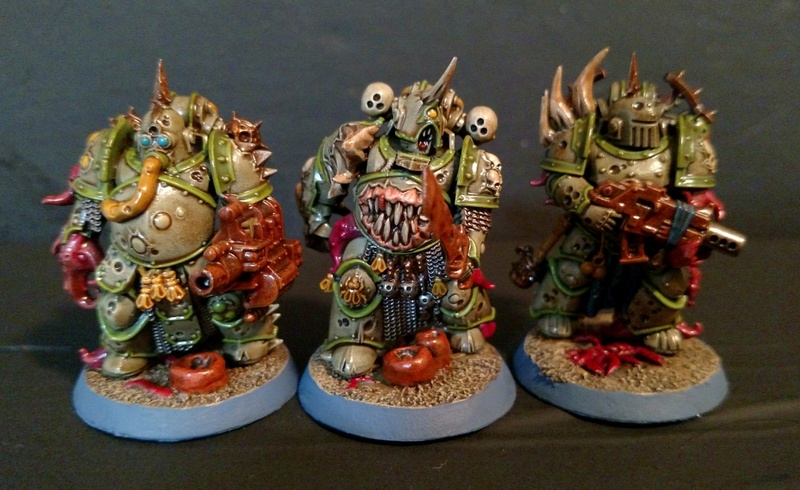 Up next are the three Plague Marines from the easy-to-build set. These models are designed to go together easily, without glue so beginners can get started in the hobby. They’re also nice sculpts to complement the other Plague Marines from the Dark Imperium starter set. 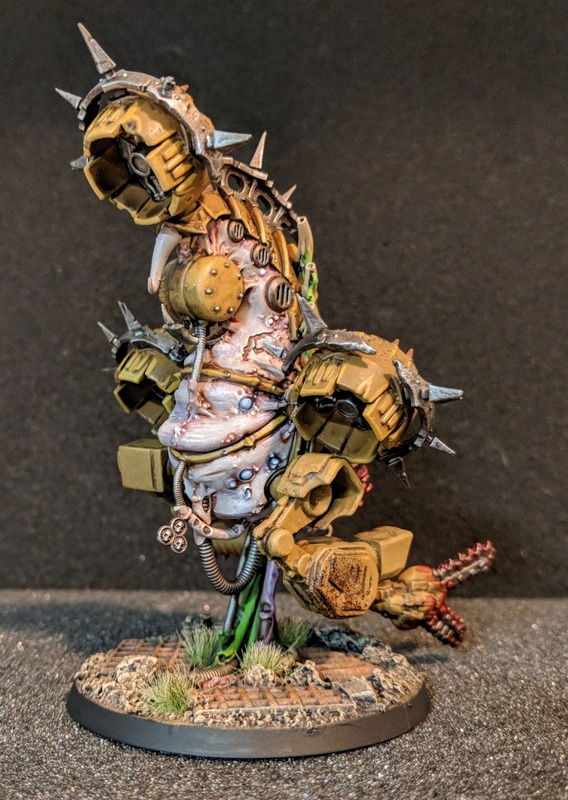 These guys got my typical Death Guard paint job — sloppy block colors followed by a magic dip of Minwax Polyshades Antique Walnut, which imparted a rich rusty shade to the armor and details. The end result is passable and shaved hours off my time working on these guys. Most of the painting groups I follow on Facebook would never dream of using the magic dip, but I’ve employed it for many years and gotten really satisfactory results. Your mileage may vary. The last figure I finished was the Foul Blightspawn. I wasn’t initially planning to include this model in my Death Guard army, but I started hearing stories about how totally brutal he was on the battlefield, so I figured I’d give it a shot. I literally finished basing this guy the night before my new baby was born! Talk about down to the wire! As I mentioned at the outset, I’ll be taking a break from gaming for a couple months. I’ll still be puttering away at a few projects in the meantime, so this blog may see some updates, but no promises. Until we game again!